Reflecting on the record-breaking rains of October 2015... Rebuilding with a broader perspective. As September, 2015, drew to a close, a nearly stationary frontal boundary set up camp over coastal South Carolina, drenching the state for days on end. By October 1, the National Weather Service began issuing warnings that a "historic and potentially life-threatening rainfall event was expected during that weekend." In spite of the rain in Tigertown, ESPN's College GameDay crew set up for television coverage flanked by Clemson and Notre Dame students charged up and draped in multifarious orange or green rain gear. This was the first return of the Fighting Irish to Death Valley since 1977, and not even turbulent rain clouds were going to hold back the flood of TV crews and dedicated football fans from witnessing the historic matchup. In the days and hours leading up to the 8:00 p.m. Saturday kickoff, low pressure formed on a stationary front hugging the coast while strong high pressure built to the north, according to DNR State Climatologist, Hope Mizzell. This pattern resulted in a strong flow of tropical moisture off the warm Atlantic waters increasing rainfall intensity over the already saturated state, she explained. To complicate the forecast, Hurricane Joaquin had re-intensified to a Category 4 storm over the Bahamas. The arrangement of atmospheric features, which included an upper level area of low pressure near the Alabama-Georgia border, high pressure to the north and a distant Hurricane Joaquin, created a river of air that was condensed into historic rain. The rain seemed to be unending. Lakes and rivers had been steadily swelling across the state. Communities along the coastal zone had already experienced some flooding earlier in the week, especially around Charleston and Georgetown. But trouble was brewing upstream as well. Meanwhile, on higher ground in the Upstate, Clemson's Memorial Stadium was packed with thousands of loyal football fans, enduring the blowing rain. DNR Assistant State Climatologist Wes Tyler said, "At 10:25 p.m., surface weather instruments at Clemson-Oconee Airport recorded NE winds gusting 28 mph in heavy rain that had been falling continuously since noon." As rain-soaked players and fans filed out of the stadium late that evening, many were getting word that road conditions were worsening and weather advisories encouraged minimal travel. Perhaps the Upstate was a safer place to stay for the moment. Meteorologists concurred that Hurricane Joaquin was taking a slow turn northward, but the rain was here to stay. Conditions continued to deteriorate by the hour. DNR's State Climatology Office assessed the flooding threats, reported water levels and worked in tandem with S.C. State Emergency Operations Center (SEOC) to assist where needed. Literally overnight, the wide-spread rain event became a full-blown flood event. Real time stream gage readings played a central role in monitoring water levels and streamflow, and DNR staff relayed this information to the public and to emergency responders as swiftly as they could. Incoming readings were alarming. According to Tyler, "At the midnight hour of October 3, Charleston Airport had recorded 11.50 inches of rain, their all-time record 24-hour amount. 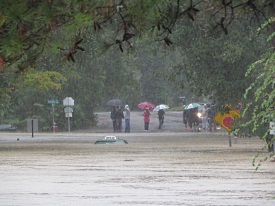 On October 4 at 7:00 a.m., Gills Creek had measured a staggering 12.68 inches of rain since midnight. The Congaree River at Columbia reached a peak and 'major flood' stage of 31.81 feet at 6:45 p.m. on Sunday, with a calculated flow of 185,000 cubic feet per second. Georgetown's 12.32-inch total for Saturday and Sunday turned the county into a lake. The Black River at Kingstree rose to a record flood stage of 22.65 feet on October 6. Measurements at Mount Pleasant had reached a three-day accumulation of 24.23 inches." Certain areas [Sumter and Andrews] received more rainfall than the 1,000 year average return interval - based on the probability that the event will be equaled or exceeded in any given year. Making headlines across the country, the historic rainfall was bringing the Palmetto State to a dead halt. By 8:00 p.m. Sunday, October 4, ten counties had declared States of Emergency and fifteen counties were operating at OPCON 1. 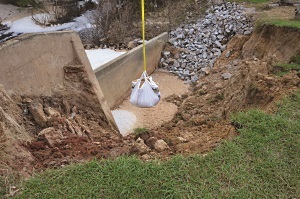 According to SEOC reports: more than 30,000 sandbags were distributed. Numerous roads and highways were closed due to flooding conditions, including Interstate 95 between I-20 in Florence County and I-26 in Orangeburg County. Between 6:00 a.m. and 5:00 p.m. that day, the S.C. Highway Patrol received 239 calls for assistance, 273 reports of trees on the road and 318 reports of roadway flooding. Eight swift water rescue teams were operating with more teams arriving from other states. DNR Deputy Director for Land, Water and Conservation Ken Rentiers recalls teams of DNR staff on the ground and in the water conducting rescue operations while their own homes were in harm's way. "Staff worked fifteen, sixteen, seventeen hours a day and never complained," he said. "It got overwhelming at times because of the personal impact. But DNR was on the scene to help." Well-trained for this type of operation, DNR law enforcement officers were on the ground and in the water equipped with the riggings, boats and trucks that were vitally needed for search and rescue missions. According to DNR reports, 158 officers were deployed across 11 counties during the flood event to assist in boating, evacuation and security operations. There were more than 930 rescues or assists, with more than 12,000 man-hours involved. DNR pilots flew officials and emergency teams over the state to assess the scope and severity of the rain event. "It's in times of natural disasters or critical incidents that you see the best DNR has to offer in its officer core," DNR Law Enforcement Division Deputy Director Colonel Chisolm Frampton said, "The 'flood of 2015' tested our manpower, equipment and EMD plans. 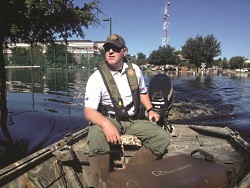 Our staff's dedication to help people in need and work in partnership with other law enforcement agencies across the state certainly helped in performing the hundreds of rescues and protecting people's property." Year-round, and well before hurricane season, Maria Cox Lamm, DNR's Flood Mitigation Program (FMP) coordinator, had been making phone calls to local governments in every county, sharing new floodplain maps and resources, setting up training sessions and offering technical assistance to prepare for flood-related events, like this one. In this role Lamm administers the National Flood Insurance Program (NFIP). She said her main focus is "helping local governments enter into an agreement with the Federal Emergency Management Agency (FEMA) and adopt a flood ordinance. We try to manage risks by way of ordinances and lower flood potential. We let them know we are here to help not regulate." As rivers overflowed and dams began to fail, Lamm said that DNR's flood mitigation team immediately started calling participating NFIP communities. Because the flooding was so widespread, and because time was of the utmost importance, she contacted colleagues in Mississippi and requested their help. "Our groups split up into two teams per community," Lamm said. "Initially the FMP teams traveled with DNR law enforcement officers and determined substantially damaged properties in the floodplain based on existing flood hazard maps. I had to use a pad and pen to write everything down because we were only getting a few hours of sleep and working six to seven days a week." Forceful floodwaters swept through cities, towns and rural areas, toppling dams along the way. In some of the more remote locations, DNR's regional staff members were tasked with containing or minimizing damage on or near wildlife management areas (WMAs) and heritage preserves. The state was quickly learning that the river and stream systems have a domino effect, and containing damage in one location might prevent damage downstream. DNR Wildlife and Freshwater Fisheries Division Deputy Director Emily Cope, stranded at her home by failed bridges and roads, immediately started calling biologists and technicians as they raced to contain or repair the infrastructure of state-owned WMAs, preserves, fish hatcheries and state lakes. "There was no way to prepare," Cope said. 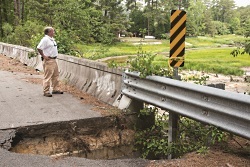 Many roads or impoundments located on remote WMA or heritage preserve lands were compromised during peak hours of the rain event, and traveling to these areas to begin repairs was next to impossible. 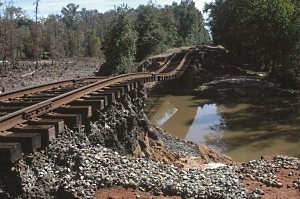 Regional DNR staff living on or in close proximity to damaged state lands were often on their own in making repairs or preventing further loss downstream. Cope received word from DNR Chief of Fisheries Ross Self that the dam at Lake Ashwood was failing. It was a waiting game, but eventually they were able to traverse through open roads to assess damages. Cope says she was shocked to find that a large, concrete piece of the dam had broken and slipped straight downward instead of falling away. In doing so, the broken concrete slab prevented the soil and other materials below from washing away, and blocked the impoundment waters from passing through the dam. "Water would have swept through if the concrete had fallen any other way," Cope recalls. It was a small, yet significant, miracle that bought time for engineering teams to lower water levels in the lake and avoid a breach in the dam." 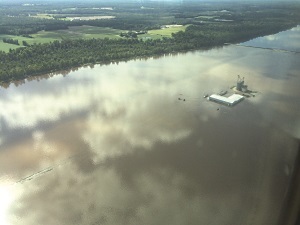 "Since October's flood event, the South Carolina Department of Agriculture has heard from countless farmers who are financially devastated and face the very real possibility of never farming again," South Carolina Commissioner of Agriculture Hugh Weathers conveyed to media during the days following the rain event. "It appears that low lying farmland adjacent to river systems and creeks was most severely impacted. The crops affected include peanuts, cotton, fall vegetables, soybeans, and some timber. Poultry farmers are working to repair access roads to get feed trucks to their flocks. Livestock and poultry assessments continue in impacted areas. Timber harvest will resume when the logging roads are passable." With planting season right around the corner and little time to spare, Commissioner Weathers and SCDA staff worked with multiple agencies and organizations to develop lifelines for farmers. South Carolina Advocates for Agriculture, a nonprofit organization dedicated to promoting and growing South Carolina agriculture, spearheaded Plant It Forward SC, raising more than $550,000 in relief funds for eligible farmers to cover a portion of 2016 seed costs, as well as hay losses. Farm aid legislation was enacted soon after, providing $40 million for farmers who sustained major crop loss due to rain damage, which was not covered by crop insurance or disaster relief funding. Commissioner Weathers adds that total agricultural losses from the October rain event are now approaching $600 million. DNR officials announced the closure of many WMA and heritage preserve lands to protect lives and allow time for assessments. Many fragile ecosystems that support threatened and endangered species were also damaged or destroyed by the excessive rain. DNR headquarters received word that Dungannon Heritage Preserve spillway had blown out. The habitat that has attracted and sheltered hundreds of wood storks over the years was suddenly at risk of being lost. DNR wildlife biologist Christy Hand was one of the first to arrive at Dungannon Heritage Preserve to assess the damage. "When I saw the severe damage to the spillway, I was very concerned about the 2016 spring and summer nesting season," she said. "The repairs that we've made to the spillway may have held some water but were not able to stop the flow." "The storm left behind millions of dollars of damage on WMA and Heritage Preserve lands," Cope said. "DNR staff tried to prevent situations from getting worse, but it will take a couple of years to repair." She reminds us that "it wasn't a centralized event. It was broad sweeping." And this presented a host of logistical problems for all involved. Cope also cites the importance of good wildlife management as a component in helping fish and wildlife species rebound. "Fish and wildlife species are resilient, but having good bag limits, proper seasons and rebuilding habitats will provide a good stage for them to recover." Stream gages. Why don't we have more of them? DNR climatology and hydrology staff monitor and compile readings from many sources, including local river and stream gage reports. Over the course of many years, scientists have strategically positioned measurement gages in the state's eight watershed regions with the ultimate goal of detecting significant or drastic changes in water levels or water flow. During October 2015's rain event, the state combatted the sudden rise of waters in the rivers and streams that flowed through highly populated areas. It was during this time that emergency response teams became acutely aware that certain areas had not yet been equipped with water monitoring devices - therefore, no gage readings or warnings were received from many critical areas. "Some of the flooding occurred where we had no stream gages, Rentiers said. "We couldn't report these stream levels. There was no data." 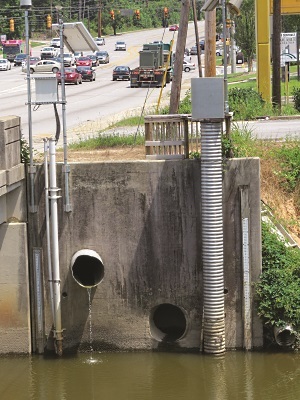 Mizzell underscores the importance of streamflow devices. "Alert systems are vital. The emergency alert network needs to be expanded and improved with additional stream gages and better flood modeling. Populations are gravitating to flood zones to be near water. Coastal and riverine flooding has major effects on both communities and natural resources." So why doesn't South Carolina have more gages? It turns out that some of the devices, due to their satellite reporting components and networking abilities, can be expensive to acquire. Rentiers explained that DNR has a cost-share agreement with the United States Geological Survey (USGS), who then contracts with the National Oceanic and Atmospheric Administration (NOAA) for satellite time. The installation cost of a single device is around $18,000 to $20,000, and the annual fee to maintain the satellite service is another $20,000 per year. Rentiers points out that South Carolina's monitoring network is growing but needs expansion to fully cover each region. Proposed models would provide resource managers with the ability to anticipate problems that might result from water withdrawals, droughts, floods or other changes in physical conditions. 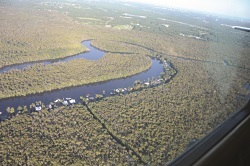 The stream monitoring program was highly instrumental during the 2015 rain and flood event, especially as dams breached and waterbodies overflowed near Gills Creek, Black Creek, Edisto River, Waccamaw River and other areas. Rentiers and his staff will continue working with local communities - region by region - to resolve planning and funding issues by building new partnerships and support from the ground level up. If you live in a flood zone, expect a flood. As flood plains were inundated during October 2015, land use issues surfaced in countless rural and urban neighborhoods, taking many homeowners by surprise. "Many communities have resisted using accurate flood maps, and developments are being built in flood hazard areas," Rentiers explains. "The impact is in front of you. There is an impact on flood insurance, and some smaller communities have difficulty funding adequate safeguards. Priorities are allocated elsewhere, until events like this happen. It falls on the community to adopt ordinances that abide by accurate flood plain maps." 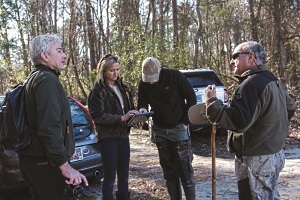 State Climatologist Hope Mizzell points out that quality of water, quantity of water, standing water and permitting in flood zones are on the short list of what needs to be addressed in South Carolina to prepare for the future. And she offers this simple reminder: "If you live in a flood zone, expect a flood." Cindy Thompson is managing editor of South Carolina Wildlife magazine. 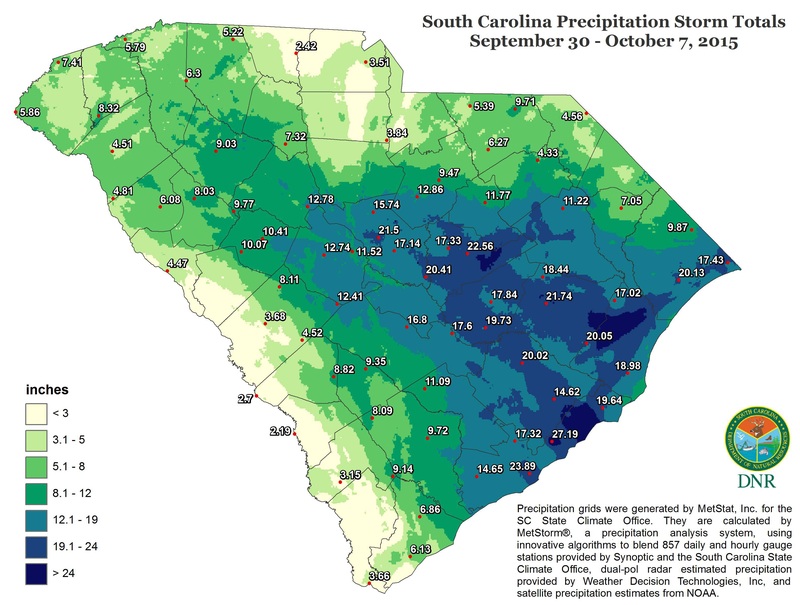 To view an interactive journal of the 2015 rain event and subsequent flooding, visit www.dnr.sc.gov/climate/sco then click on the Interactive Journal link. Visit our website - www.scwildlife.com - to view additional video content related to this story. Gills Creek near Columbia was hard hit by flooding in October of 2015. Watch this SCW Shorts video to learn about the cleanup necessary to restore the watershed.